Get the sourcecode of Modern UI POS PayPal donate. I need some help to raise some funds on my PayPal account that is why I setup this donate and reward program. Send a PayPal gift for atleast $20.00 and get an access to MetroFramework Modern UI POS Source Code. Minimum $20.00 if higher much better!!! 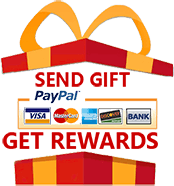 By using the button above you not purchasing any product but sending a gift and by doing this you will get a reward. By just donating a minimum of $20.00 I will give you an access to my google drive that contains the MetroFrameWork Modern UI SourceCode. This is a limited offer only, I will make this available for 5 days only. Once I received your gift, I will link your email address to my google drive. Please put note on your donation if you want to use different email to be linked to my google drive.